June 10, 2015 By Debra Schroeder Leave a Comment This post may contain affiliate links. Traveling Well For Less has partnered with CardRatings for our coverage of credit card products. Traveling Well For Less and CardRatings may receive a commission from card issuers. Opinions, reviews, analyses & recommendations are the author's alone, and have not been reviewed, endorsed or approved by any of these entities. Read my disclosure policies. Searching for the best places to eat (and drink) when traveling can be both challenging and fun. Sometimes you hit the jackpot and find a fantastic restaurant, other times you’re not that lucky. 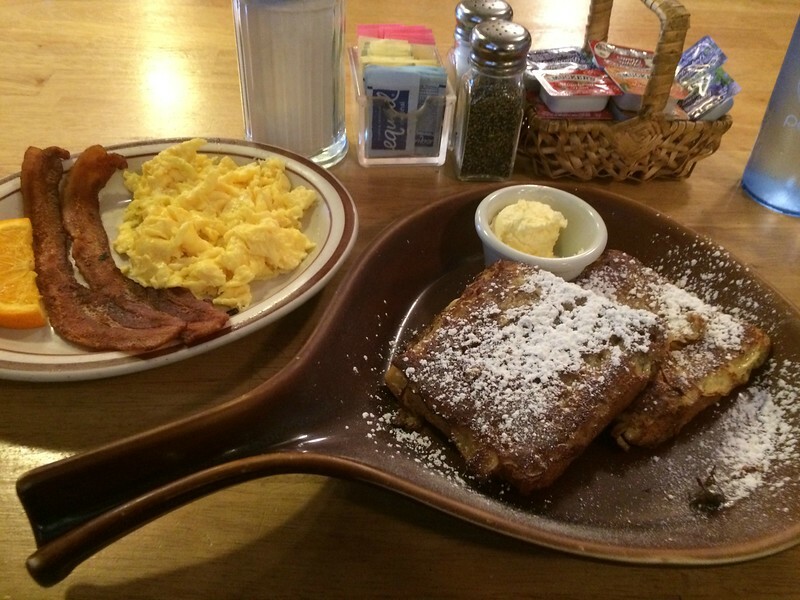 That’s why if you’re looking for the best breakfast spot in Bend, Oregon, you should have breakfast at Palmer’s Café. It’s no secret that I love to eat. Especially breakfast. Give me a waffle or an interesting French toast and you’ll have my breakfast heart forever. I spent four days in Bend, Oregon, recently and used Couchsurfing and Airbnb. So I got to eat breakfast out each morning. Dining out is part of traveling, but sometimes it’s nice to have a home cooked meal. Especially if that meal comes from a restaurant like Palmer’s Café. 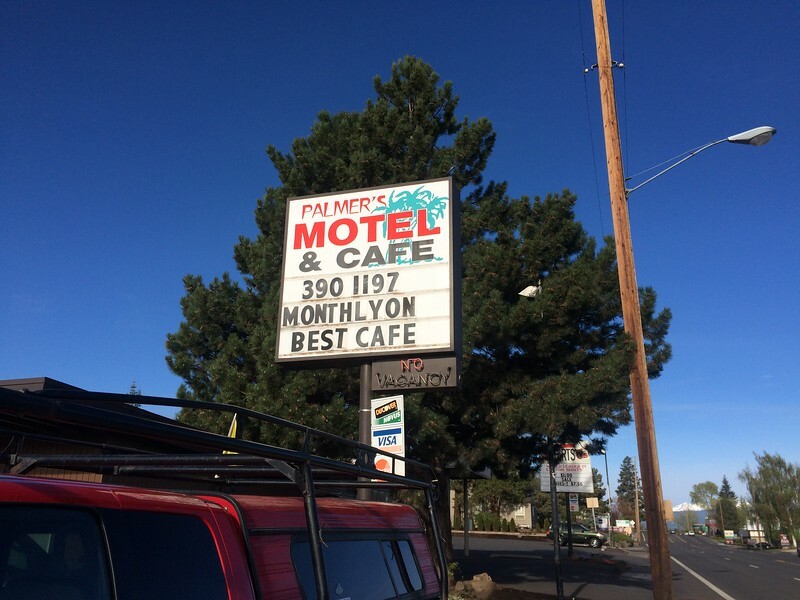 You’ll find Palmer’s Cafe in a nondescript motel along Highway 20 on Bend’s eastside. The sign is partially hidden by a giant tree if you’re driving from the west. So prepare to make a right-hand turn into the parking lot just past the TShirts R US shop. Palmer’s Café represents typical Americana. Wholesome, salt of the earth, neighborly food. It’s a mom and pop (and pop) run café by owners Karen and Michael Kau and Harry Johnson that take mom and pop to another level. 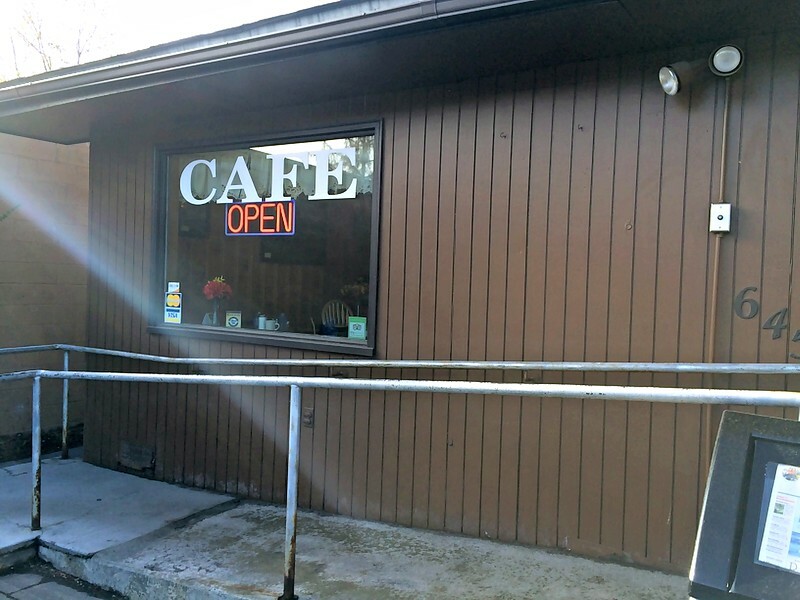 Palmer’s Cafe may not look like much on the outside, but your stomach will thank you. The lodge-like exterior fools you into thinking there aren’t a lot of tables. But Palmer’s Cafe is larger than it looks with ample seating indoor and out. The tables can be easily moved depending on how many are in your party. And while Palmer’s Café may be considered small by modern restaurant standards, it’s large when it comes to friendliness and portions. You’re immediately greeted upon entering with a warm and engaging smile. The kind of smile that is real and genuine, reaching the tips of the eyes. It’s a smile that says, “I’m really happy to see you and glad you came.” Whether you’re a local, tourist, or first time visitor, there’s no distinction. Everyone is equally welcome. 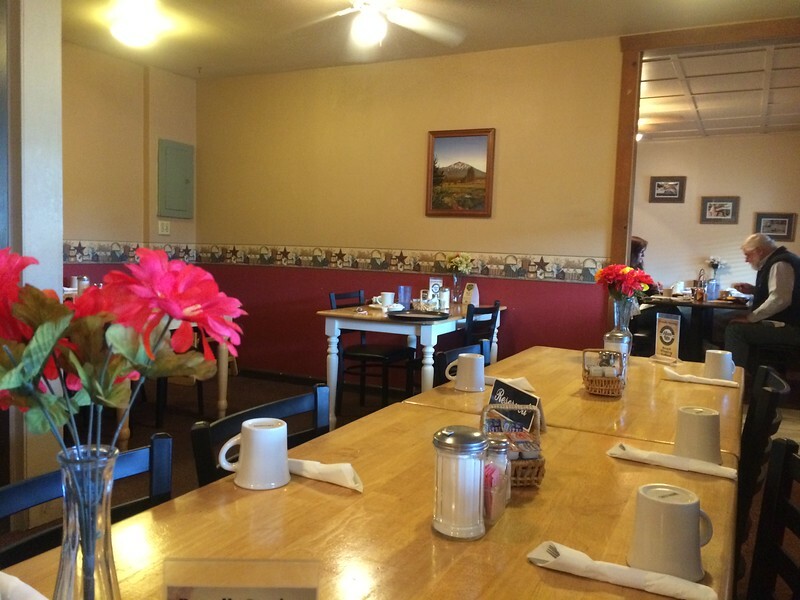 But at this hidden breakfast gem in Bend, Oregon, you won’t find a lot of tourists. That warmth extends to the service you receive. Although inside seating is coveted during the winter and busy times, you’re never made to feel that you’re taking up too much time. Unlike some restaurants where your check is brought along with your food, lingering at Palmer’s Cafe is encouraged. Here you’re company and treated as such. The prices aren’t inexpensive and are comparable to restaurant prices in California and the rest of the West Coast. But the pretense is skipped and the portions are generous. A three egg scramble served with a choice of hotcakes, home-style breakfast potatoes and toast, or fruit and toast will set you back $12.75. But it’s almost too much for one person and more than enough for two to share. Your food is served on a griddle baking stone and your sides include an orange slice garnish. The type of plates that your mom used for special Sunday breakfasts growing up in the Midwest. The breakfast menu is two full pages. I couldn’t decide between the Blueberry Banana Nut French toast, the waffle with blueberries and whipped cream, or the Creme Brulee French toast. Both the Blueberry Banana Nut French toast and the Crème Brulee French toast come with a side of 2 eggs and 2 strips of bacon. 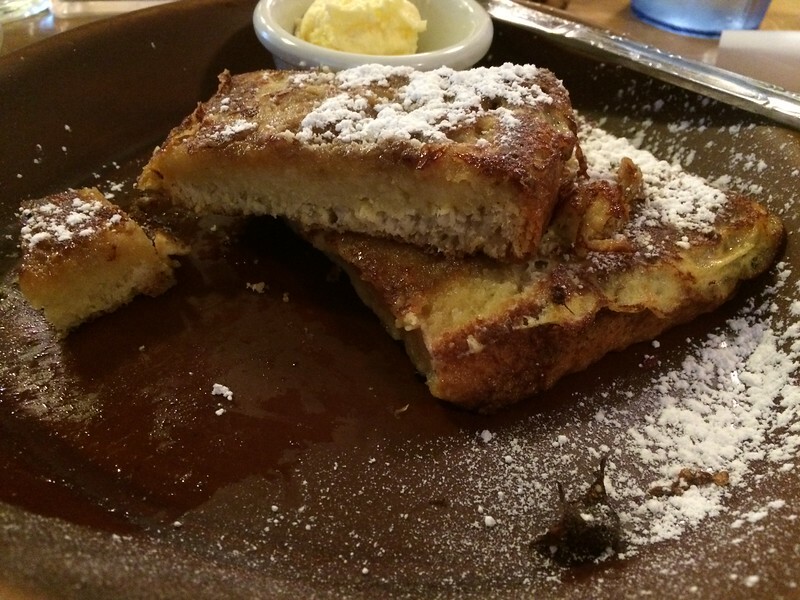 But the Creme Brulee French toast is only offered once a month on the weekends. So I wasn’t about to miss out. A crispy crust with a heavy sprinkling of powdered sugar (not that I minded) puts Palmer’s Cafe’s creme brulee french toast in a league of it’s own. It’s sweet enough to skip the warm syrup but not too sweet that you’re put into a food coma (or diabetic coma). The scrambled eggs were tasty without being runny or watery. And the bacon. Oh, the bacon. From the photo it may not look like much but it was crispy yet tender, almost but not quite a beef jerky consistency. I managed to polish off my bacon and eggs but barely made a dent in the 1 inch thick, chewy pieces of french toast. Only able to finish half a slice, the leftovers were the perfect snack for later that day. Remember to check the specials board above the fridge before you order because they change frequently. And if you’re aren’t sure what to order, ask your server. Attention to detail is evident by how often you’re checked on by your waitress and Karen. Coffee and tea drinkers will never worry about having a dry cup. Care is taken down to the littlest of details from a constantly on crockpot to keep the bottles of syrup warm, at the just the right temperature to enhance your pancakes or French toast, but not too hot to scald or create a film in the bottle. This is Bend, Oregon, but Palmer’s Café could be in the heartbeat of America. It’s the type of place you imagine along a dark, deserted stretch of highway. A refuge in the storm. That oasis in the desert if you will. The perfect spot for a homestyle breakfast. And if this is your first time visiting Palmer’s Café you get 10% off your order. Don’t worry you don’t have to ask, they’ll ask you. Palmer’s Café is located at 645 NE Greenwood Avenue, Bend, Oregon. They offer free Wi-Fi and serve breakfast all day. But they’re only open from 7 a.m. to 2 p.m. daily. Did you like this post? Feel free to comment below, share this post, or give me a +1. Want to get more travel tips, learn how to travel for free, find out about travel deals, and maximize your miles and points? To receive post updates by email, please use the subscription box at the top right of the page. Read our blog via RSS feed. You can also follow me on Twitter, like me on Facebook, or add me on Google+. Copyright © 2012 - 2019 , Traveling Well For Less. All rights reserved. This site is for informational and entertainment purposes. The owner of this website is not a financial planner, investment advisor, legal or tax professional. All articles are based on opinion, have not been reviewed, approved or otherwise endorsed by any of the entities mentioned in the post, and should not be relied upon for your individual circumstances. We are a participant in the Amazon Services LLC Associates Program, an affiliate advertising program designed to provide a means for us to earn fees by linking to Amazon.com and affiliated sites..